Hi folks! 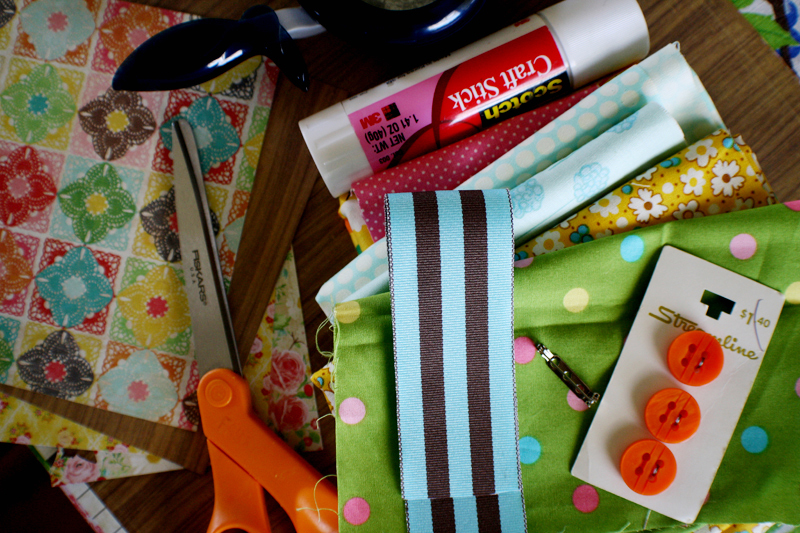 I’m Jessica (aka jek of scumdilly-do!, scrumdillydilly and CRAFT) with a super fun craft that allows you to use up small fabric scraps, your sewing machine and sticky glue. I was at Michaels a couple of weeks ago and saw some pretty awesome handmade-style award ribbons and medals. They were really happy and super nifty and a bit more pricey that I can afford being that I’m unemployed and all… and I thought “How fun would it be to make these up for some favorite people I know?” And so I did. So go rifle through your craft drawer, box or closet and see if you can rustle up some supplies to create a “Just Because Medal of Goodness”. Cut a length of ribbon at least six inches but not more than twelve. 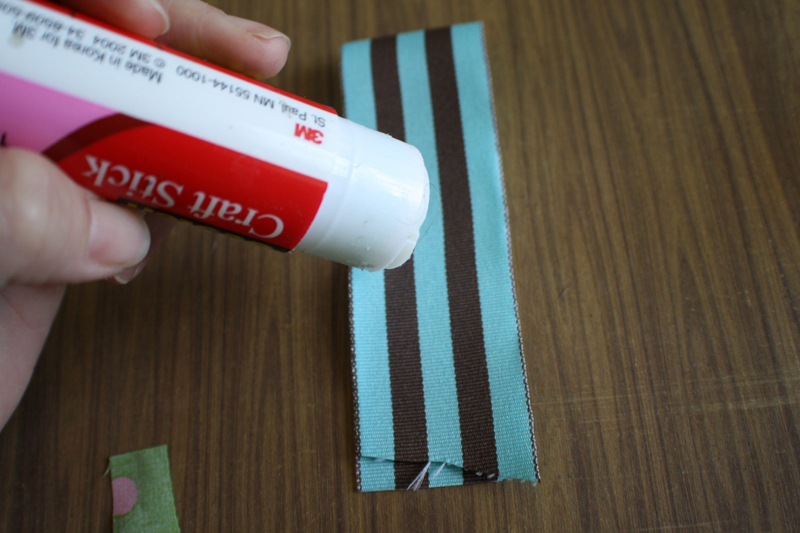 Coat the back with your glue stick and fold in half, pressing down to help tack it in place. 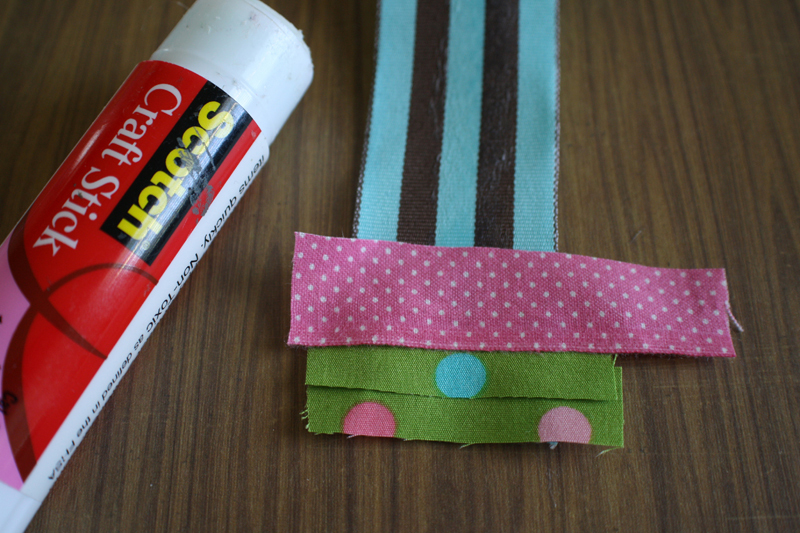 Grab that happy glue stick and slather on a bit of stick to the front of your ribbon as well. We’re just using the ribbon as a base to sew on. 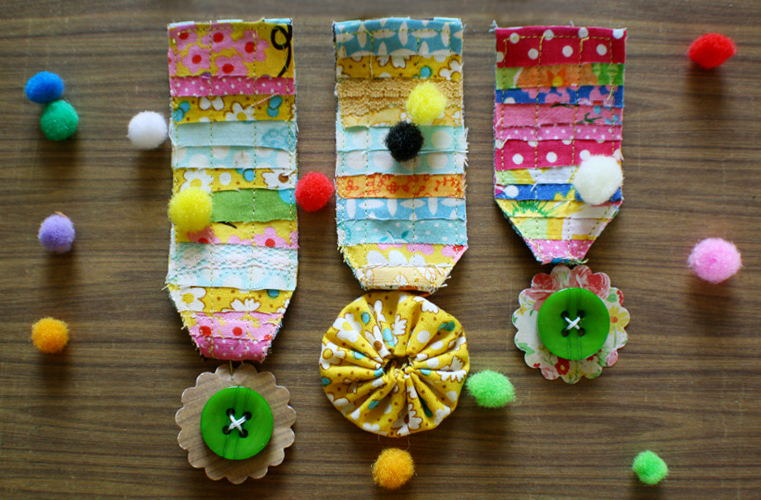 You can also use felt if you do not have ribbon. Just trim felt to size and omit the glue stick since they really don’t play well with each other. 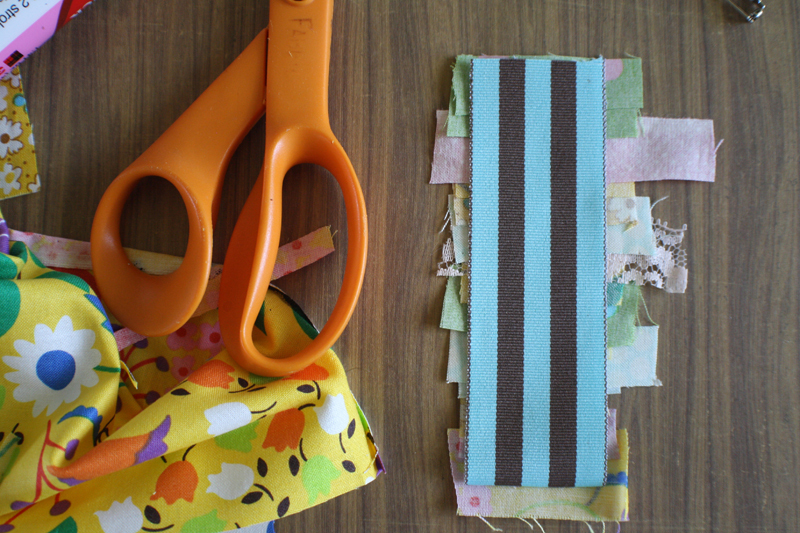 Begin layering lengths of fabric onto your sticky ribbon. Begin at the bottom and work your way up. 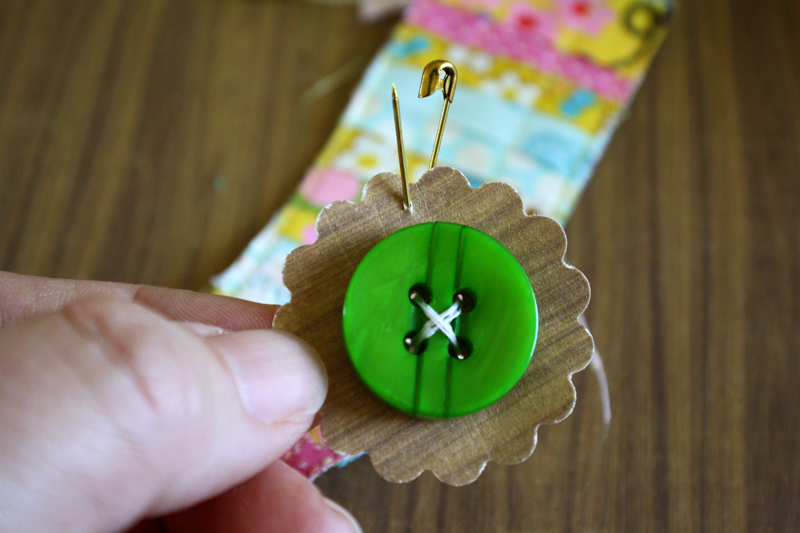 I like to run the fabric scraps atop the glue stick for a little extra tack. Continue until your ribbon length is covered. Turn over and trim fabric bits around the ribbon. Flip over and trim the bottom of the ribbon so that you have a point. 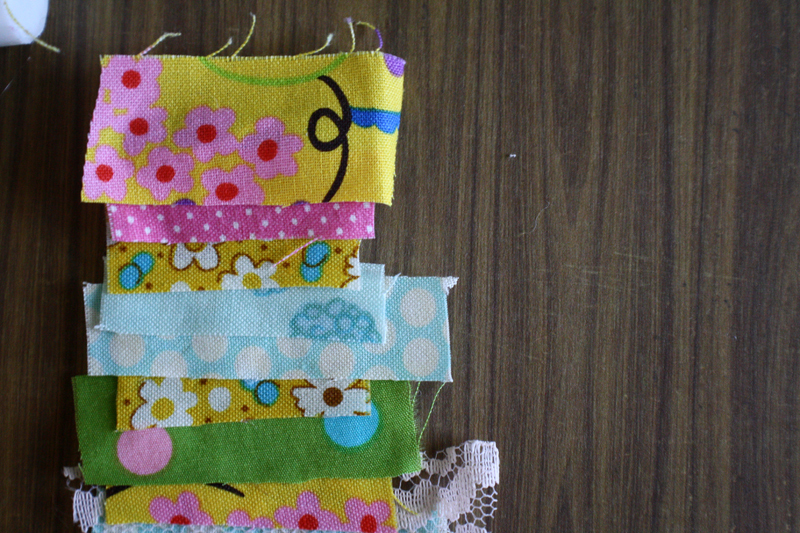 Take your bit of happy scrappy ribbon over to your sewing machine and stitch around the edges as close as you can. I used a very small stitch. Don’t forget to backstitch. 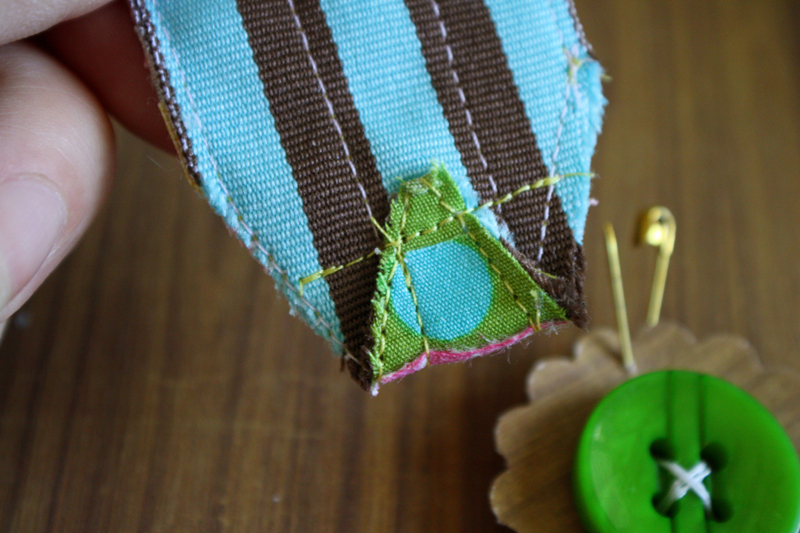 Add an additional line or two of stitching in between the edges for a little more oomph and trim your threads. 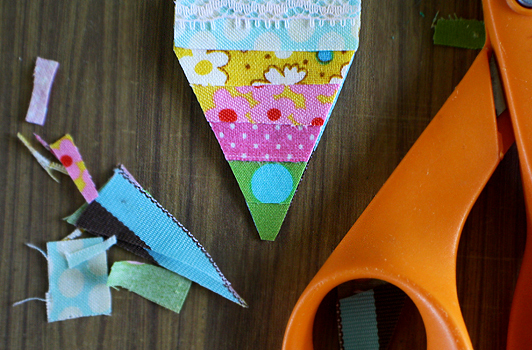 Fold up the bottom of the pointed end and anchor in place with your sewing machine and trim those threads as well. 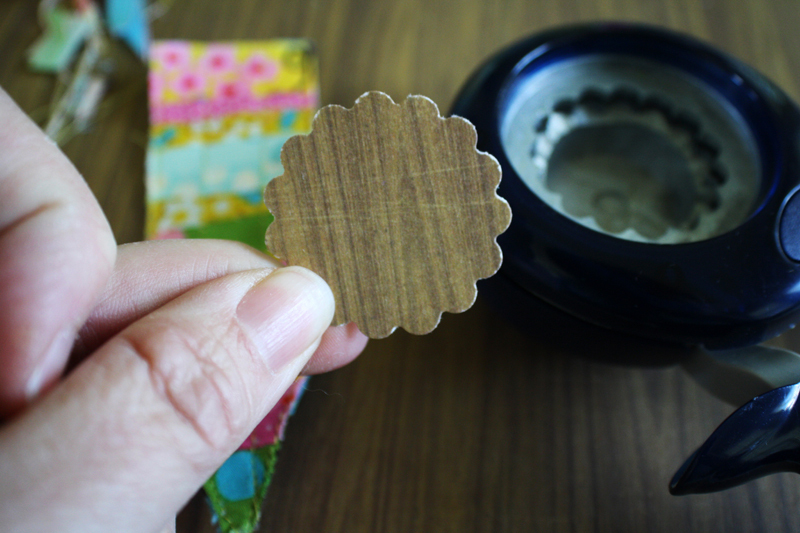 To create the “medal part” of your medal, use a scalloped paper punch to punch a pretty bit of paper. 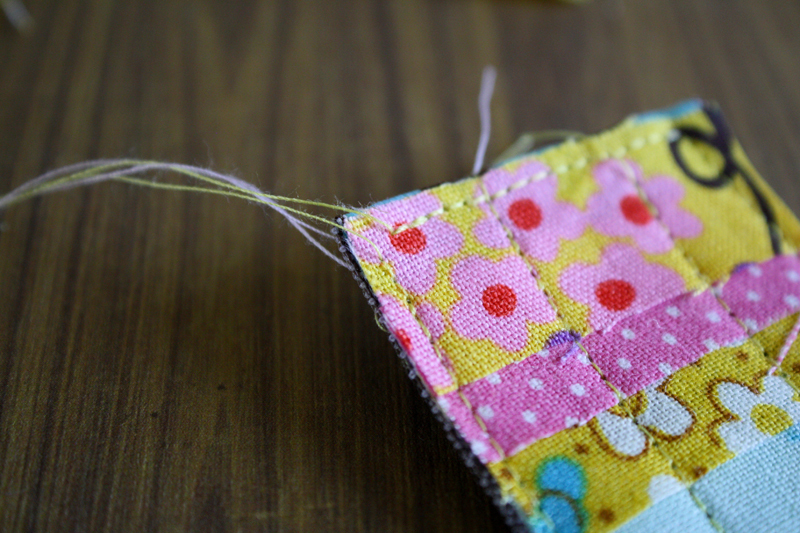 Hand stitch (or glue) your happy button in the center of the punched paper. 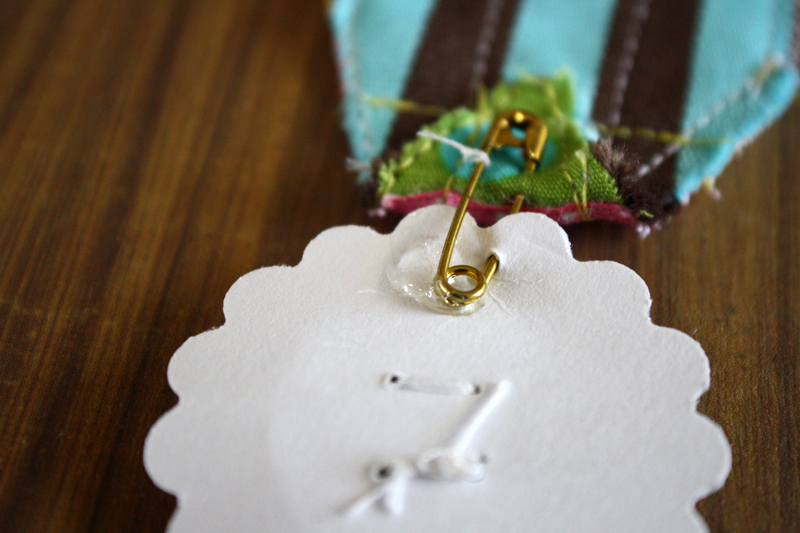 Use a small safety pin to attach it to the bottom of your medal’s ribbon. You can also use wire or thread for this. Flip the whole shebang over and use your super sticky glue to anchor your pin-back in place and allow to cure for 12 hours or so (drats). And that’s it, yer finished! Unless you are anything like me, which will entail you rifling through your happy-scrappy craft supplies in search of more happy bits and doo-hickeys to create more medals. 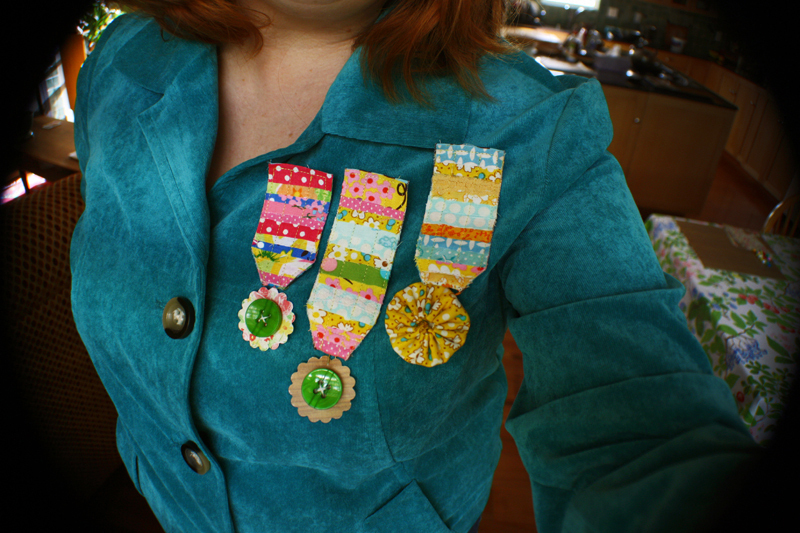 I used a yo-yo instead of craft paper for one of the medals and my noggin is already overflowing with more ideas! I hope you have a blast and thank you for reading!